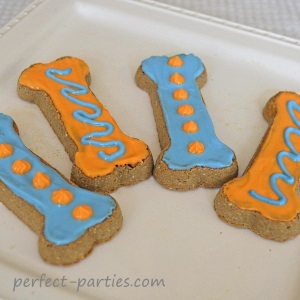 This doggie birthday cake is a favorite of our pups! A carrot cake with yogurt icing makes this a special treat for special occasions. 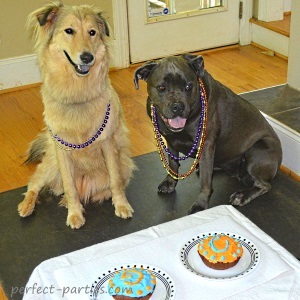 This recipe yields two pup cakes. Preheat oven to 350 degrees F (175 degrees C) Grease a small 5 inch baking tin. We used Bakers Joy. Combine the egg, peanut butter, oil, vanilla and honey in a large bowl and blend well. Sift together the flour and the baking soda and fold into the carrot mixture. Bake in preheated oven for 35-40 minutes. Let cake cool in the pan for 10 minutes. Then turn out onto a wire rack to cool completely. If needed, thicken with a teaspoon or two of flour. Using wheat flour may change the hue a little so you might want to use white flour. Be sure to wait until your cakes have completely cooled. 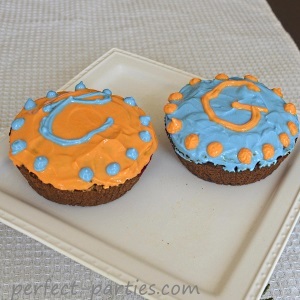 We painted on the frosting with a pastry brush. With the extra frosting we painted biscuits. We refrigerated the pup cakes and biscuits to let the frosting set.